The Etch-a-Sketch level select screen. Cute. Despite the youthful audience, the game features some decent controls. Jumping -- always important for a platformer -- uses the B button. Hitting jump again in mid-air extends Buzz's wings for the purpose of floating to distant places. The bread-and-butter of Toy Story 2's action relies on two forms of attack: an arm-mounted laser and a simplistic "spin" attack. Either can be charged up for greater damage by holding the button down. Buzz's laser can also be used in a first-person perspective not unlike a sniper mode, which has to be a first for a Disney game. Although you cannot move around in this first-person mode, the R trigger allows auto-targeting of any visible target. Sniping has never been easier. Actually, the whole game is this easy... It's almost more difficult to die than it is to live. Normally this would be a cardinal sin for a game. In Toy Story 2's case, however, the game is designed for munchkins who probably wouldn't appreciate the frustration of a Deus Ex. Instead, it's a healthy heaping of simple-minded puzzles and slow paced action. First off, don't even bother playing Toy Story 2 unless you're too young to drive a car, impatiently waiting for the Lady and the Tramp DVD, or have an unnatural attraction to that cute Woody doll. Everything about this game screams "rubber ducky wallpaper." If you don't fit that profile, look elsewhere, because Disney has targeted its audience well. Not a high point in the history of clipping boxes. In some areas, though, Toy Story 2 misses the pre-teenager mark. For starters, it has the most convoluted, unintuitive VMU system known to man. Saving requires only a one button affirmative response -- that is, as long as there's space left on the VMU. If the VMU is too full, it kicks you out without even the option of overwriting an existing file. 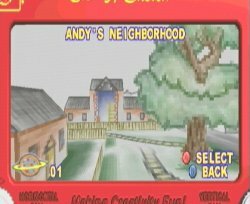 You can delete a pre-existing Toy Story 2 save game, but only after returning to your game in-progress, exiting to the VMU managment screen, and choosing the "Delete" category. Confusing? It is, and this is not the kind of hax0r crap that seven-year-old gamers are accustomed to. Loading games is just as annoying, but I'll spare you the gory details. Suffice it to say that Traveller's Tales didn't spend a lot of time designing the VMU interface. Another problem lies with the camera angle. 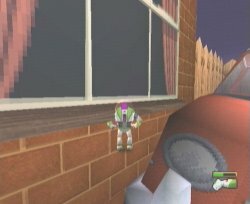 Toy Story 2's action is displayed from directly behind the player character. You can switch between "Active" and "Passive" modes that determine whether the camera spins around automatically or by your control. As far as I can tell, though, there's no way to adjust its vertical position. Since your view is parallel to the ground, it's difficult to judge depth on a two-dimensional television screen. This is death in a 3D platformer -- you can't tell if the ground is below you when jumping. Fortunately, there is no fall damage in Toy Story 2, just incredible frustration as you keep missing the same tree limb over and over again. Lastly, Toy Story 2 is a direct port of the Playstation title of the same name. This is generally bad news; PSX ports are like Kryptonite to the Dreamcast. In some areas the 32-bit origins are obvious -- in the construction yard, for example, the ground textures are Doom quality at best. I should warn you that these Playstation-conversion shortcomings have really turned off some of the editors here at GameSpy. Still, I don't think the too-young-for-Shenmue audience will care about the weak graphics as long as Toy Story 2 can harness their attention spans with its simple gameplay. With its actual film clips and recognizable characters, Toy Story 2 is going to attract kids in droves. The variety of ways to progress in the game should keep them glued to the set. But be warned: there's very little here for us older gamers. For anyone who still prefers Dennis the Menace to South Park, though, Toy Story 2 has their name written all over it. Highs: Well-liked characters, multiple game modes, great for kids. Lows: Unintuitive VMU system, warmed-over PSX graphics, poor depth perception, not-so-great for anyone over 13. Other: 1 player, VMU Compatible (12 Blocks), Jump Pack Compatible.